All new Cardas Cables come with a Certificate of Authenticity. We recommend keeping this document, should you ever want to sell your cables. If your certificate becomes lost, or if you've purchased a second-hand pair of Cardas cables that did not come with a certificate, a new one can be obtained. To get a new Certificate of Authenticity, we must inspect your cables in person, at our shop. To arrange a re-certification, click here to fill out our Return Authorization Request Form. If your cables are deemed authentic, there is a $25 charge, and you'll receive your cables back along with a new Certificate of Authenticity. Please note that our Certificates of Authenticity come with, and are only available for, Cardas cables terminated at the Cardas factory. 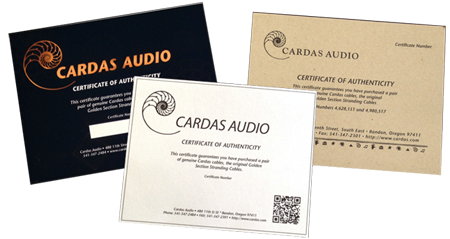 Cardas parts, accessories, bi-wire jumpers, bulk cable, Ear Speakers, wood blocks, caps, CDs, LPs and other Cardas products are not eligible for a Certificate of Authenticity. To read more about our Certificates of Authenticity, and to see various versions of the certificates, please click here.